I received an email from one of our closest friends- Dr. Bob Santos- regarding an anecdote he wanted very much to share through this blog. He calls it “The Introduction” about the first time he met Mariel. 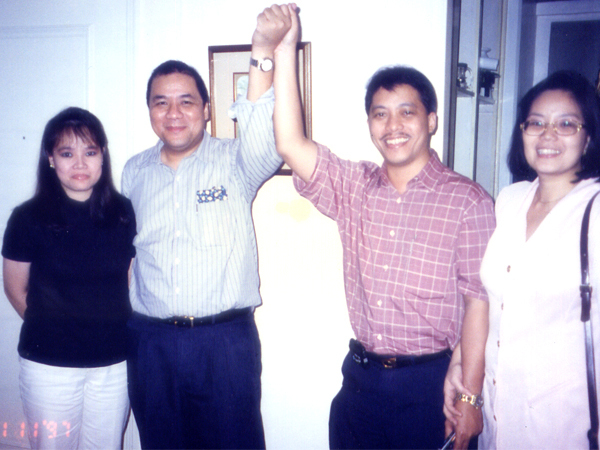 By the way, Mariel was the very first lady I had formally introduced to my close friends and even to my own family too. She was after all the ONE. The only woman who really stirred my heart enough for me to joyfully shout to the world that the long wait is over. I have finally found my soul mate, life partner, wife and best friend. I leave this article unedited for Bob to tell it like it really was. It is both funny and heartwarming. Friday was D-day. How could I forget that fateful evening in the 90’s! our very own Bong Bello, the last of the bachelors, was formally introducing his “conquest” to this band of UPSCA brothers.Now we have heard of this or that damsel he met in one of his electric forays. But a formal introduction?!!! No way! Not Bong.Not his style.Slam bam, thank you ma’m. She is probably one of those nameless ones. This I got to see. That evening at Pilo’s Restaurant in Katipunan was quite a revelation. To my surprise Bong actually brought along a lady! It started a little uncomfortable for the rosy Mariel, surrounded by “bubuyogs” Bong, Allen, Monser and myself (Dr. Albert was out butchering patients) all ready for the roast. The guys were their usual boisterous and foolish selves, but Mariel was trying very hard to remain composed. Not for long. “so what kind of music do you listen to?” Mon blurted out. Suddenly the table was silent. For the boys, her answer was important. We were bonded together by our common love of rock, jazz and progressive music, with Bong as the high priest of guitars. The question was definitely a probe. Anything less than Holdsworth, Hendrix or Zeppelin was blasphemy! A Michael Bolton would have driven us to tears. And a Sharon Cuneta answer would have soured our friendship irreparably. Sensing a trap, it took Mariel an eternity to answer, glancing at darling Bong, fishing for reassurance. Finally…”Gershwin”, she said nervously, hoping for acceptance. Silence followed. Then Mon, the true friend that he is, came to the rescue — “Ako rin Gershwin…Gershwind and Fire!” The table suddenly exploded with laughter with Mariel also teary-eyed from laughing. Composure definitely gone, Bong heaved a sigh of relief. At that point on, I knew it was just a matter of time. Trick or Treat? 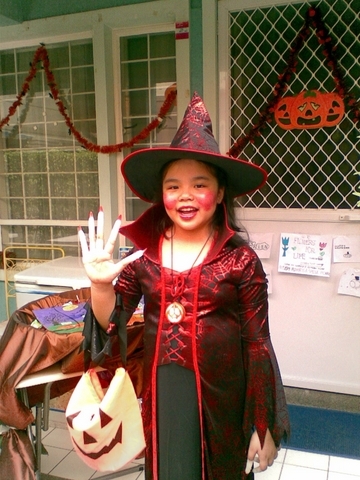 Those who read my previous post Sam News # 3 will remember that this year, Sam’s costume of choice is… the Devil Witch. The Halloween committee at Lexington Garden Village have decided that costumes must conform with a strictly mandated “horror theme”. So, we therefore chose to comply. Sam would have however wanted to come out as Gabriella from High School Musical 2, but.., Which makes me wonder why we all have allowed Halloween to be turned into some kind of competitive sport. Call me, a grumpy, andropausal, middle-age spoilsport but can we please go back to a time when Halloween meant painting an old T-shirt with skull & bones and making do with ketchup as fake blood. Besides, only Toy Kingdom benefits from this Hallo-hype. Nevertheless, Sam enjoyed herself today and was even a finalist in the costume parade. Well, I better start preparing for next year’s event. How about… “Creature from the Black Lagoon”. Am I showing my age? Can you help me out “Mommy”? May I add too, that I had to fight more lumps in my throat again as I was holding Sam’s hand for the parade. Mariel’s enormous shadow looms large in occasions such as this. For she was the soul of our family. And now that’s she’s gone, I feel like a grumpy, andropausal, middle-age guy trying to write a blog about Halloween to keep himself from missing her. I really miss you so much, Mariel. I love you. It’s Saturday, Oct. 27 and I’m at the office finishing up on some work as well as tending to “Mariel’s Garden”. Sam’s away with my sister Alma doing trick or treating somewhere in Pasig. Every year, Mariel prepared for “the” Halloween event. Last year, she personally designed Sam’s Cruela De Ville outfit. 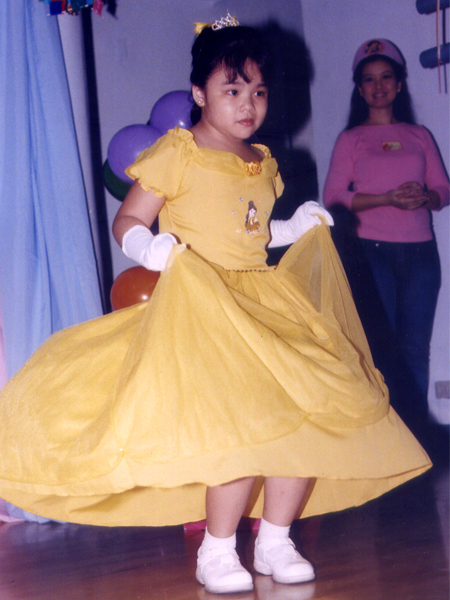 Before that, it was Belle and characters from the Disney portfolio. It’s all for fun and games. And the chance to dress up the “doll” of her life, Samantha. Mariel was very creative with costumes and stuff. Well actually, she was good with just about everything. Decors, crafts, clothes, writing etc. I even hate to admit it but she was way more creative than me, and I’m the one that actually does it for a living. This year, Sam’s outfit will be of the “witchy” kind, courtesy of Tito Baguie, who had picked this costume in a recent US trip. Everyone has been so kind and helpful to us both, trying to ease Mariel’s absence now from our lives. We truly appreciate all the love and care we have received. But while Halloween too shall pass, it will never the same at least for me. For I no longer have Mariel to “tease” about having some-other- kid’s-costume- as- being- nicer than Sam’s. Or having a rare, special day spent with just the two of us as Sam’s out trick or treating for the rest of the afternoon with her cousins. Instead I’m alone at the office, flailing at my old computer, grasping at fleeting memories and wishing I had Mariel beside me now to say, I love you “Mommy”. Mariel had always looked forward to planning Sam’s yearly Birthday celebrations. It was mostly coming up with fantasy themes like Kim Possible, Winx Club etc. and would have a nice excuse to make Sam wear some unique and colorful costumes. Or worrying about some clown or emcee that preoccupied Mariel on those June days. Surprisingly, this year however, she suggested doing something different. She proposed instead, for us to go on a trip together. It was an “expedition” to Singapore that coincided with the annual “Great Singapore Sale”. Those who knew Mariel know how much she loved to shop. I also wished this one so she could “relax” a bit, as she had been unusually busy at work in past months. I then made quick arrangements ( just a day before our trip) with the travel agent and off we were to our Great Singapore adventure. It wasn’t our first trip out of the country together. Since about two years earlier we also brought Sam to the US for the usual Disneyland, Universal and Statue of Liberty jaunt. Back then, we had traveled with my mother – Conchita, who was quite close to Mariel. Uncommonly, this time however, Mariel wanted our travel to be an exclusive one. I even partly resented the idea thinking that we could have more fun with a bigger party. Of course, I did not know that in about three months later, Mariel will no longer be with us. Had I in some way known this, then I would have done more to treasure our every moment in this trip. I would have taken more pictures of the two of us together. (I got only one). I would have taken more time having that leisurely breakfast at Wisma. I would have made sure to be with her more in her shopping excursions rather than waste time on my own selfish bargain-hunting. For in the end, all I had left are the memories, random snapshots and a deep regret that maybe I should have been more mindful of the “clues”. Things like, Mariel not buying anything for herself despite the great lure of “the” sale. She had bought tons of presents for everyone but left out her own wishlist.Very puzzling. 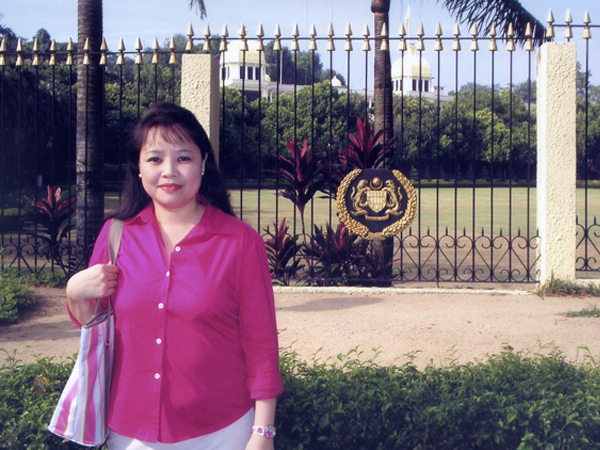 She had made sure that Sam enjoyed the Sentosa attractions even if it meant braving some rainy Singaporean episodes. She had even wanted me to have that fancy wristwatch I could only lust for at the watch store. She was giving me extra “attention” in the Singapore trip but I had not really taken notice. Maybe, because I’m was so used to her taking care of me. Because I had always known that we will someday grow “old and gray” together. 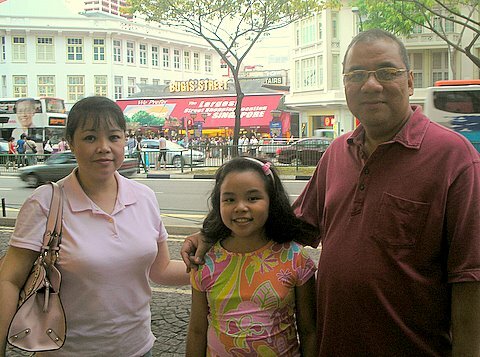 Because I had always thought that we will have many more “Great Singapore” shopping trips to make. And all I have now are these snapshots. I miss you “Mommy” so very, very much. Lola Mommy is what our daughter calls Mariel’s mother Aurora. On October 25, even after Mommy Auring passed away, we would often go to Tarlac to “visit” Mommy on her special day. Happy Birthday Mommy, I know you are now with Mariel watching over us and keeping us safe. We love you and will never forget your kindness and thoughtfulness. Love and kisses too from Sam. People have noticed that the color lilac and its siblings have always caught the eye of Mariel. Yes, you can check out her coffee mug, toothbrush and of course, her wardrobe and you’ll immediately see an obvious theme. Mariel’s well developed fashion sense however, does not preclude all the other lovely colors like pink, orange, red and apple green, all of which she adores too. But, Mariel it seems has a special fondness for this special shade of royalty. My princess loves everything about it. I used to kid her when we go window shopping that she can’t resist any blouse or dress in this color specially when its on sale. My very first gift to her in fact was a purple jewelry box ( without any jewelry, by the way) in that special color. I, of course, promised her to fill up the case with the desired content someday. Today I remember her purple jewelry box, violet umbrella, lilac mini- electric fan and ube-tinted shades with special fondness and some sadness. My princess has now gone to the great purple paradise in the sky and I fervently wish I still could still add one more lilac- colored something to her collection. But alas, I could now only shed purple tears and hope to meet her as soon as God allows in our lilac garden and purple- themed house in heaven. I love Mariel.